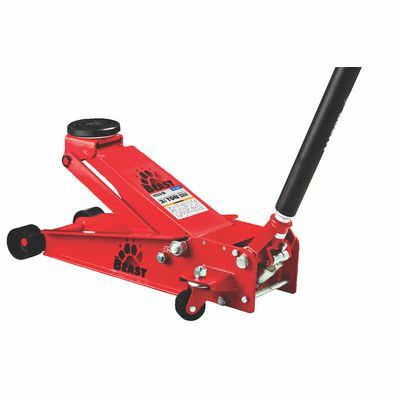 3-1/2 TON FLOOR JACK is rated 4.0 out of 5 by 10. Rated 5 out of 5 by RichKam from Love Matco products. My Jack has done everything I've asked of it. I love it! Rated 1 out of 5 by Jackie271 from Tough steel. Bad pump. Worked great for 20 uses. Pump stopped lifting. Hard to find and expensive seal kit or new pump needed. Rated 2 out of 5 by jack123321 from Expensive and not quite worth it Loved the rapid pump feature and thats what sold me on it. It hasnt worked properly in some time now. There are no options for parts or rebuild kit other than the expensive off the truck stuff. Also ended up hard to release to lower after a short while. Needs a complete new pump assembly almost $200. I'll probably just buy another lesser expensive jack. I have an old $100 craftsman thats just as good as they day I bought it. Rated 5 out of 5 by Hondadoc246 from heavy... but works; and safe Use it in driveway for installing snow tires on my own cars. 2 Honda's, put it under front lift point, 7 pumps, both wheels off ground ! AWESOME. Rated 5 out of 5 by Xavier123 from Buy this Beast. Since I carried this hefty Beast off the tool truck, it has been seen extensive use. I use it mostly for checking front ends on 2500 and 3500 trucks on the floor, quicker than racking one up. The long handle provides good leverage, large wheels roll easy and the cup is large enough to find a piece of frame to grab. Rated 5 out of 5 by Kevo from Good Other than being rather heavy, I like it. Raised the car quick and fit under. I was worried it would be to tall to fit under a low rideing car when I ordered it, but it worked normally. Low rideing as in a Pontiac Grand Prix normal riding height. Rated 5 out of 5 by TheHeatisOn from Awesome, tough quality! This is the best choice you'll ever make when trying to figure out which Matco jack to buy. Rugged, tough, dependable. Lower profile to get under them "car show quality" cars. Awesome product!